Dr. Wolchok accepts the following list of insurance providers. Select your insurance provider to see more details. I am a medical oncologist who specializes in caring for people with melanoma. As a researcher, I am working to develop innovative ways to use the immune system to treat cancer. I have been at the forefront of cancer immunotherapy as a clinician-scientist and as a principal investigator of several pivotal clinical trials. One of these was a large phase III trial that led to the FDA approval of ipilimumab (Yervoy®), an antibody now used as a first-line treatment for people with advanced melanoma. Ipilimumab was the first drug ever shown to improve survival in these patients. It has fundamentally changed this disease’s outcome — people who were once given a matter of months are living years longer in some cases. A number of patients I treated with ipilimumab in 2004 are still alive and free of cancer today. As a physician, nothing is more gratifying than being able to give someone his or her life back after cancer. Despite the successes of ipilimumab, only about 20 percent of melanoma patients respond to the drug. This experience led me to test ipilimumab in combination with another immune drug, called nivolumab. I designed and led the phase I, II, and III clinical trials that led to the FDA approval of this combination in 2015 for advanced melanoma. You can hear about one patient’s experience with this combination here. 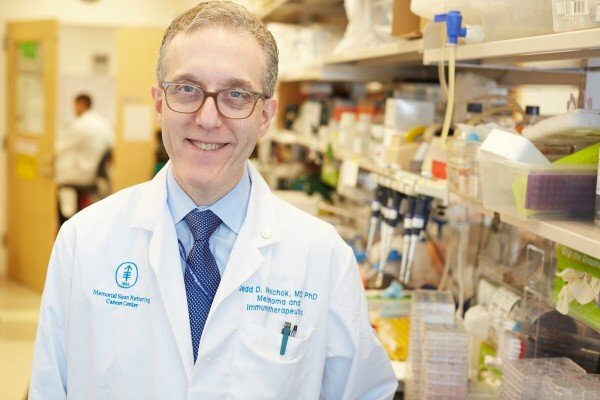 In 2011, I established the Immunotherapeutics Clinical Core, a specialized phase I outpatient unit at MSK that conducts novel immunotherapy trials, with a specific emphasis on identifying molecular biomarkers that can predict response. This group treats patients with a variety of cancers and has become a model for similar efforts by other major cancer centers throughout the world. I received my undergraduate degree from Princeton University and my MD and PhD degrees from New York University, where I also fulfilled my residency program. After completing my fellowship at MSK, I remained on the faculty as part of the Melanoma and Immunotherapeutics Service. I am also a professor of medicine at Weill Cornell Medical College. Visit PubMed for a full listing of Dr. Wolchok’s journal articles. Pubmed is an online index of research papers and other articles from the US National Library of Medicine and the National Institutes of Health.